This book, The Times of the Gentiles, written by Brother Gingrich, deals with a remarkable portion of the prophetic teaching of Scripture, Daniel, chapters 2 and 7, a portion which challenges us today to live in submission to the mighty God by whose will the world’s empires rise and fall. 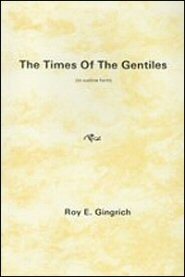 The Times of the Gentiles joins the host of other books from the pen of Mr. Gingrich. Like them, it combines the author’s warm love of God and the Scriptures with his simple style of communication to make this book a book which any Christian can understand and from which he can receive profit.